Find a good spot and plop down in your picnic dress for an impromptu meal on the grass. Picnics are great because they allow us to appreciate the great outdoors (sometimes motivating us to take more efforts to protect it). But sometimes picnics are not so great because they result in picnic littering, or the use of non-biodegradable plastic plates and silverware, or excess garbage in general. 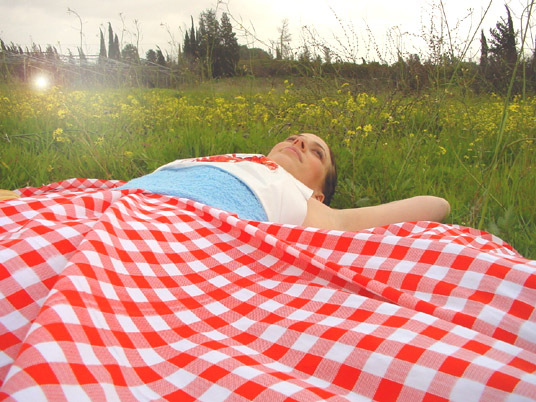 The Buttercup picnic dress, though, from the Israeli designers at Reddish Studio (the same team that brought us the bath tub chair and the upcycled candlestick menorah) solves these problems with a design that allows you to plop down, have a picnic, and get up leaving no litter behind. The dress is made from three different food related fabrics: a plastic lobster bib (forming the halter top), a kitchen towel (around the waist) and a table cloth (for the skirt). No need to bring paper napkins, you can wipe your hands on your belt! Are you a sloppy eater? Spills can easily be wiped off of your plastic bib top. And when you’re done with your picnic, no need to throw anything out. You can wash your dress and save it for another sunny day. fresh loans, since that time. 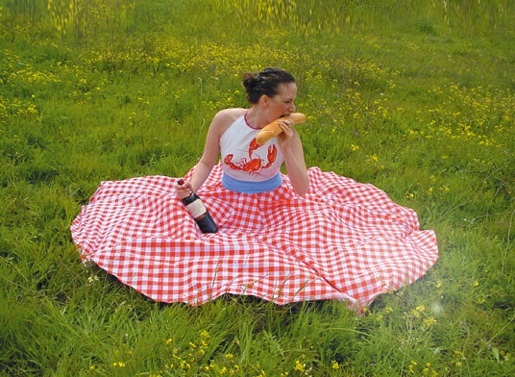 You could just stand up and twirl to get all the crumbs off your picnic dress.